We love to create recipes that look fancy but are super easy to make, and they really are the perfect way to wow friends and family with minimal effort. Our latest show stopper is an icebox cake inspired by the flavors of Boston cream pie – it looks super pretty and tastes ahhmazing! So much cool and creamy goodness is hidden below a thick layer of chocolate – yum! This recipe is virtually foolproof, and easy ingredients like pudding and graham crackers make it fun for little ones to help with. Don’t get us wrong, we love to bake! But sometimes it’s nice to whip up a homemade dessert without having to turn on the oven. 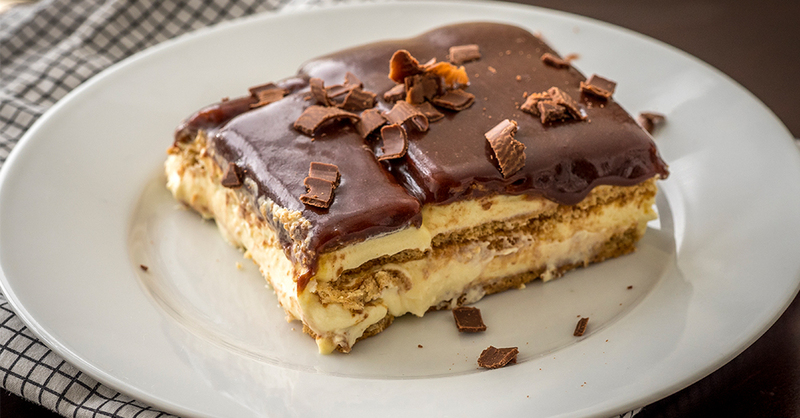 So the next time you’re craving Boston cream pie, give this refreshing no-bake recipe a try, we bet you’ll be hooked. Be sure to make extra! For the topping, combine all ingredients in a saucepan over medium heat, stirring frequently. Once chocolate, butter, and sugar have melted completely and all ingredients are fully incorporated, remove from heat and pour evenly over top layer of graham crackers. Cover tightly and freeze at least 4 hours, or overnight.